Home > Hearing > Can Stem Cells Restore Lost Hearing? Currently, there is no way to reverse the loss of hearing that occurs either with ageing or because of noise damage. However, recent research done in the USA suggests that it might be possible to reverse deafness in the future using stem cells taken from inside the brain. The cells in the cochlea inside the inner ear that are responsible for our sense of hearing have tiny hairs that vibrate when sound waves hit them. The movement in the hairs is converted into electrical impulses and sent to the brain. Processing in the auditory cortex converts these impulses into what we perceive as music, speech or someone scraping their fingernails down a blackboard. As we age, the hair cells start to die and they can be killed in large numbers by repeated exposure to loud noise. Once these cells have died, they cannot be regenerated so the ability to hear the sounds that they detected is lost forever. This is why hearing loss is currently irreversible. Scientists in the USA, based at the University of California at Davis announced at the end of 2008 that replacing these lost hair cells might eventually become a possibility. They have been looking at the idea of taking stem cells from the brain and transplanting them into the inner ear. The conditions there should stimulate them to develop into new hair cells. 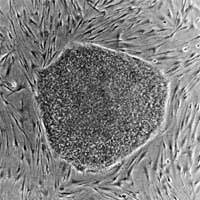 Stem cells are a relatively recent discovery in science and medicine. Usually, all of the body cells, whether they divide actively like those lining the intestines, or whether they never divide such as those in nerves, are set in their ways. Each has developed as a specific type of cell and they can never become any other type. Stem cells are different. These cells are found in the embryo as it develops and they have the capacity to develop into a wide range of different cell types. One of the great hopes in medicine is that stem cells could be used to replace damaged cells that do not usually regenerate themselves. Stem cell treatments to restore lost hearing, lost vision or to bridge severed spinal cords could all be developed in the future. The scientists working on the hearing loss problem are using ependymal cells that line the lateral ventricle of the brain. These are very similar to the hair cells of the inner ear except in one important respect – the brain cells are stem cells that are able to divide. The idea is to move some of these cells into the inner ear where they would grow and form cells that could detect sound and also provide the important nerve connections into the brain. These nerve cells tend to wither and die once there are no more electrical signals from the hair cell they are associated with. At the moment, using stem cells is very much an experimental procedure and much of the work has not yet been done in people. One major problem is the ethics of having to go into the brain to get the ependymal cells; this would not be without risk. Other scientists think that the inner ear might have some cells that could act as stem cells and that would be far easier to obtain. Either way, this research is likely to take 10 to 15 years to become a treatment, and that is if everything goes well. Apart from using stem cells from the brain or the inner ear, some groups are also working with stem cells derived from embryos. However, this is fraught with ethical problems too, as some people do not believe that it is right to use embryos in this way. Researchers in the USA who are part of the US military are also very interested in restoring deafness caused by noise damage. Soldiers there are exposed to explosions and gunfire and this type of hearing loss is common. It is all very secret but one company has claimed it is researching drug therapies that could reverse hearing loss. Again, the research is at a very early stage and could take at least 10 years before it is available as a treatment.